Famous for its entry through an old red telephone box, the Jazz Cellar is small and cosy with a fun and intimate atmosphere. Come on in to this delightfully decked out vintage treasure chest. 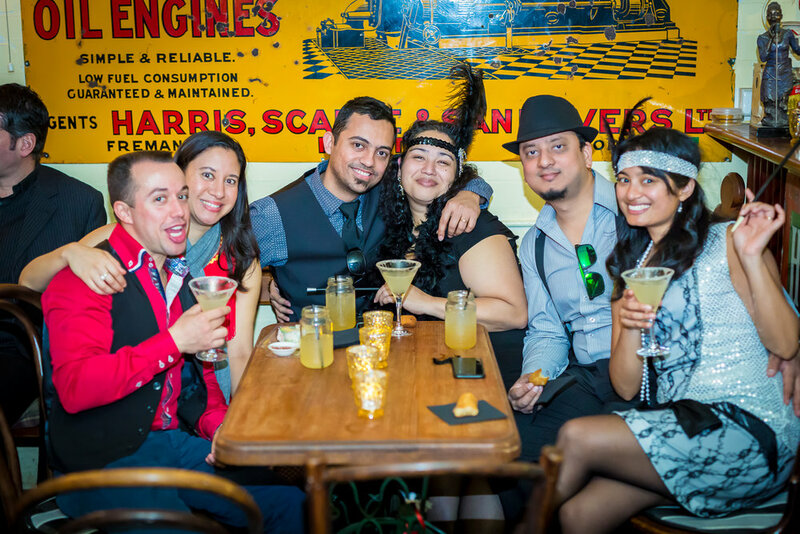 You'll feel like you are in another time where you can be yourself, bring your friends, eat, drink, be merry, have a dance or sit back and be entertained. The rare ambience you get at the Jazz cellar is the result of the fusion of the great music and entertaining antics of the band, our resident dancer Robin, the intriguing vintage furnishings, artefacts, and enamel advertising signs covering the walls. The Jazz Cellar just oozes with seductive charm! You will be stimulated in the most delightful and unique way. So grab some friends and come on down! Popular in street parades & community events, the Corner House Jazz Band's very own 1920's Dennis Fire Engine is available for hire!